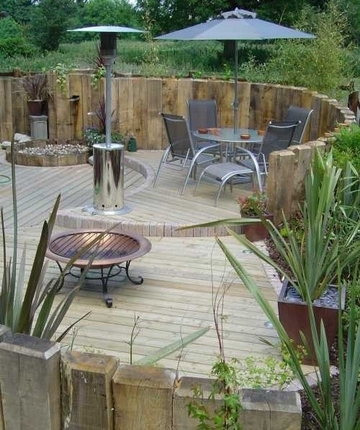 New oak of softwood sleepers are ideal for using in gardens and can be used for a variety of things. These sleepers aren't technically railway sleepers, as they have never been seen on a railway. But they are similar in size and shape they have adopted the name. They are a great multi-tasker for garden landscaping. The safe, Eco friendly pressure treatment in our softwood sleepers means they can be used for outdoor furniture, and are safe for children's play areas, unlike the creosote treated sleepers. It also means that they are well protected against rot and insects. New Oak sleepers, like the pressure treated sleepers are great for path edging, borders for flower beds, raised flower or vegetable beds, steps and pond structures, amongst other things.New oak sleepers mellow to a nice silvery colour and age well over time. Softwood sleepers can also make great pergolas, they are much lighter to handle and cut than new oak or creosote treated sleepers. Another great idea for a raised vegetable patch are our used or new scaffold boards, available in 13" lengths they are ideal for veggie patch or other garden projects. 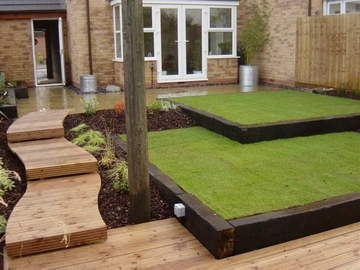 Traditional creosote treated sleepers are great for retaining walls and other projects, they are a lot heavier than there softwood brothers, and usually require a two man lift. Garden furniture is a must have in this day and age, with the focus being completely on outdoor living, when the weather allows. Everyone benefits from having a secluded area where you can sit and unwind at the end of a long day. 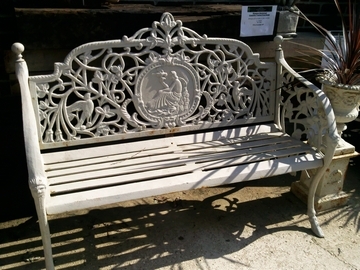 this is much more pleasant experience if you have comfortable, eye catching furniture. 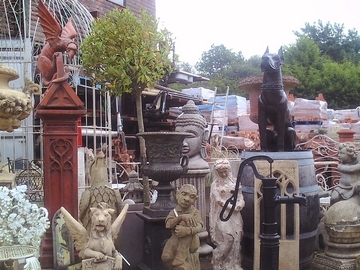 Here at Ace Reclamation you can choose from a large selection of outdoor furniture including cast iron benches, we also have a variety of unique statues and urns, staddle stones, and flag stones to make any garden look special.